If your office or workplace recently experienced water damage from a flood or another natural disaster, you’ll want the help of commercial drying and dehumidification experts to get rid of any excess moisture. Your search for reputable water restoration companies in Michigan can stop here. DriForce is a licensed, insured and bonded water removal company, and is certified by the Institute of Inspection Cleaning and Restoration. Our water removal technicians are fully-trained, so you can trust that we are providing you with reputable drying and dehumidification services for your business. More specifically, our water removal experts have the water mitigation and restoration training necessary to get the water thoroughly removed from your office, store, plant or warehouse. 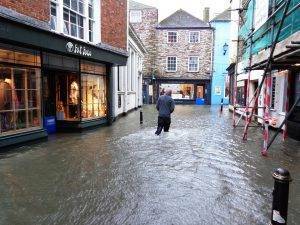 We are available for commercial water damage removal 24/7, so get in contact with us as soon as possible before the water does any serious damage to your workplace. An excess of moisture in your place of business could lead to mold growth, which is not something you want for your employees and customers. Mold not only has a strong, unpleasant odor, but it can also be dangerous to your health. Fortunately, the water can be removed from your workplace before any mold growth occurs. Reduce the risk of mold growth in your office by taking care of the water damage as soon as possible. Once DriForce has completed your commercial water damage cleanup, your office, store or workplace will look and feel good as new and be ready for your employees and customers. If you’re located in the Metro Detroit area and are looking for water damage removal services for your place of business, look no further. DriForce offers prompt and professional drying and dehumidification services with minimal downtime so that your Metro Detroit business is clean and healthy for your employees, customers, visitors and yourself. Your water damage was unexpected and you shouldn’t have to suffer. Don’t let the water damage set your work back. Let our experienced experts handle the water removal process for you so you can get back to work as soon as possible. Give the moisture removal technicians at DriForce a call at (877) 638-0081 so we can get started on drying and dehumidification of your business immediately.